Have you ever noticed this emblem in a seed catalogue or on a seed packet? It indicates that the plant has been awarded the approval of the All-American Selections organization. This group was founded in 1932 with the expressed purpose of improving plants available to North American growers. Newly developed varieties that have never been sold commercially are submitted by their developers and are tested in 45 sites in the US and Canada. Each site is overseen by the All-America Selection judges. The judges are typically professionals in the field of horticulture. They are unpaid and chosen for their ability to manage a trial garden, experience with plants and impartiality. 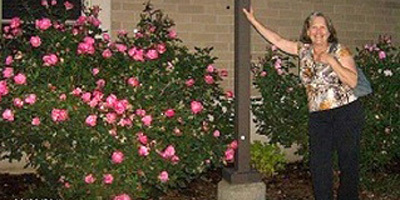 The sites are generally at universities or at the trial gardens of seed companies or other horticultural institutions. They are located in 25 states from Main to Florida, with 5 ranging the length of California. The one in Pennsylvania is in Doylestown. There are also 7 sites in 4 provinces in Canada. The motto of the All-America Selections organization is “Tested nationally, proven locally”, guaranteeing success of the chosen plants in the widest range of conditions. Every year, from newly developed varieties, 1-6 flowering plants and the same number of vegetables are chosen. The flowering plants are judged on the basis of “novel flower forms, flower colors, flower show above foliage, fragrance, length of flowering season, and disease or pest tolerances or resistance.” Vegetable are evaluated for “earliness to harvest, total yield, fruit taste, fruit quality, ease of harvest, plant habit, disease and pest resistance.” High on the priority list is the ability of the plant to thrive with little care. These choices do not require constant attention and will tolerate the maximum amount of neglect. This year 4 annuals and 3 vegetables have been chosen as All America Selection winners and granted the coveted seal. Tomato ‘Lizzano’ (Solanum Lycopersicum) is an F1 hybrid that produces a cherry type tomato that is about 1 inch in diameter and approximately .4oz. and of excellent eating quality. It produces abundant fruits 105 days from seed sowing or 63 days from the setting out of transplants.The plant is semi-determinant growing 16 to 20 inches with a spread of 20 inches. Its trailing habit and small size makes it ideal for hanging baskets and patio pots. In the garden it is best staked to maintain compact growth. Llizzano’s main claim to fame is that it is late blight resistant. It will maintain growth and production later into the season even when the fungus for late blight is present. This trait might just prove useful if late blight again devastate the tomato crop. The seed is available from Park’s seed for $4.25 for a packet of 10 seeds and from Totally Tomatoes at $2.95 for 10 seeds. Tomato ‘Terenzo’ (Solanum Lycopersicum) is another F1 hybrid cherry tomato. It is larger than Lizzano, reaching 1 ¼ inches and .7 oz., and is judged to be one of the sweetest of the cherry type tomatoes. The fruit is resistant to cracking and the plant is impervious to the summer heat. Fruit production is abundant, starting 56 days from setting out. The plant is low growing with a trailing habit making it ideal for hanging basket and patio growth. It reaches a height of 16-20 inches and a spread of 20 inches. The plant is determinant and easy to grow requiring little maintenance. Determinant tomatoes tend to set fruit over a short period of time so this might not be a desirable tomato for those looking for a long harvest period. Terenzo is available from Park Seeds for $4.25 for 10 seeds and from Harris Seeds for $3.45 for 10 seeds. The third All-America Selection vegetable award was given to a smallish pumpkin (Cucurbita pepo), named ‘Hi Jinks’. This is a fairly early pumpkin, which is always useful in our short growing season. It matures in 100 days from seed and 85 days from transplant. 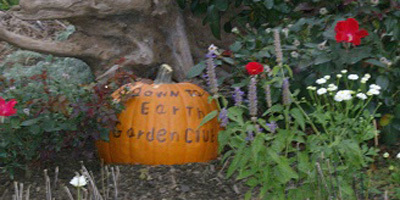 The pumpkin weight about 6-7 pounds, has smooth skin and has a uniform shape ideal for fall decoration or carving. The regular groves give it typical pumpkin like appearance. It is said to have a very sturdy stem eliminating the problem of the stem separating from the pumpkin when it is picked or transported. This pumpkin is mildew resistant and is a very prolific bearer. Anyone who has ever grown pumpkins or squash has probably watched the vines succumb to mildew late in the season before all of the fruit has ripened. As you would expect in something that is said to set a large amount of fruit the vine is quite long, reaching 15 feet. Two cool season bedding plants were chosen for recognition Viola ‘Shangri-La Marina’ (Viola cornuta) is an F1 hybrid that was cited for its “drive by flower power”. Presumably this indicates that the light blue, 11/4 inch flowers are not only highly visible but are super abundant. The center of the flower is dark blue with a white border. This is a new color for violas. The flowers maintain their color throughout the growing season. Violas are biennials and this one is said to flower 70 days from sowing. This is very early for this type of viola which typically flowers 84-98 days after sowing. The plants are low growing and form symmetrical mounds. 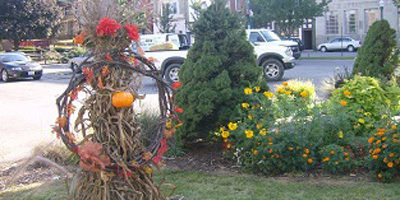 Fall color is excellent and the plants recover to start blooming early in the spring. Violas do not typically overwinter in our area, unlike pansies, but this one is said to survive colder winters. Viola ‘Shangri-La Marina’ is recommended for low borders and hanging baskets. Note that this plant is an F1 hybrid that will not come true from seed. It is a biennial, so typically to maintain the plant for more than a couple of years it must reseed itself. You will not have this one long unless you continue to buy the seed, which is available from Park Seeds for $3.95 a packet. The second cool season bedding plant that was chosen is not actually a flowering plant. ‘Red Glamor’ ornamental kale (Brassica oleracea) is the first kale to ever be so honored by the AAS group. While this kale is technically a vegetable and edible, it was selected for its bright color that flames when temperatures drop below 55⁰ F for at least two weeks. This kale is the fringed leaf variety. The leaves are glossy, lacking the wax coating common to ornamental cabbage and kale, and the colors are formed in concentric circles with a bright pink in the center surrounded by green with an outer layer of purple green. The plant was selected because of its intense coloration. The head size is 10-12 inches and the plant is about a foot tall. The flowering plant award for 2011 went to Gaillardia ‘Arizona Apricot’ (Gailardia xgrandiflora).Galardias, also known as blanket flowers, are perennials but tend to be short lived. However, this one does not specifically say that it is an F1 hybrid so perhaps the seed is stable and it could be saved. Arizona Apricot was chosen specifically for its flower color. The flower is 3-3.5 inches across and is an apricot color, paler than typical orange gaillardias. The outer portions of the petals fade to yellow. The plant is free flowering and produces masses of blooms from early summer until autumn. Dead heading is necessary to keep the plant blooming freely. The specs for the plant emphasize that the plant does not need vernalization (a cold period) to bloom so the plant should bloom from seed the first year if planted early enough. The period from sowing to bloom is 105 days. The plant is hardy from zones 2-10 and is reasonably drought tolerant once it is in place. A compact plant at, 12 inches high and 12 inches wide, its suggested use is a massed planting in the front of a perennial border. Seeds are available from Parks Seeds at $2.75 for 25 seeds or from Swallowtail Garden Seeds at $2.49 for 20 seeds. The 2011 bedding plant winner is the annual Salvia ‘Summer Jewel Red'(Salvia coccinea). Summer Jewel Red is a prolific bloomer producing half inch intensely red flowers from spring to autumn. Its 50 day span from sowing to flowering is one of the reasons it was chosen for the AAS award. This is about 2 weeks earlier than comparable sages. The plant is 20 inches tall and produces dense branches. The leaves are dark green and compliment the bright red of the flowers. This salvia remains compact throughout the season. The plant is impervious to wind and rain and is suggested for use in full sun areas in pots or massed in beds. As an added bonus the flowers are ideal for humming bird gardens as the bright red flowers are well loved by humming birds. The seeds are a favorite food of goldfinches. Be reminded that the common name of this plant is Texas sage and it originated in the south west of the US and Mexico. While the All- America selections are tested in and are supposed to thrive in a wide variety of conditions the heritage of this plant suggests that it needs much heat and sun to thrive. Good drainage is probably also a must. The seeds for Salvia ‘Summer Jewel Red’ can be found at Harris Seed for $2.60 for 50 seeds and at Swallowtail Garden Seeds for $2.49 for 30 seeds.